The Allure Collection exudes timeless elegance with this five unit necklace. The intricate lacy detail of Allure is made from 18ct white gold and set with 0.18ct white diamonds. 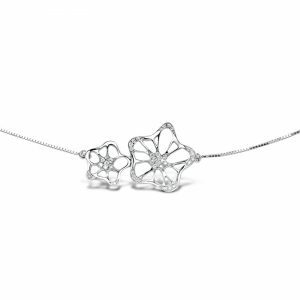 This necklace will give those precious moments that extra sparkle. The Allure Collection exudes timeless elegance with this two unit necklace. The intricate lacy detail is made from 18ct white gold and set with 0.9ct white diamonds. 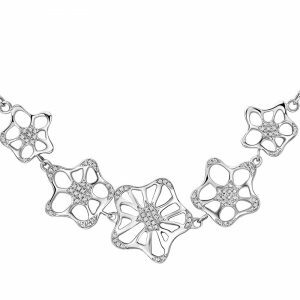 This necklace will give those precious moments that extra sparkle. A luxurious 18ct gold collection full of drama and elegance. The Whispering Collection emulates femininity and glamour, with its sculptural yet delicate filigree detail. The small pear stone pendant is available in black rhodium vermeil filigree setting, set with a 8ct green amethyst or 8ct purple amethyst. Also, available in 18ct yellow gold with a 8ct citrine. This open ring from the Alyssum Collection is graceful and features with a flower shaped white mother and 0.035ct diamonds, set in 18ct white gold and finished with a high polish. 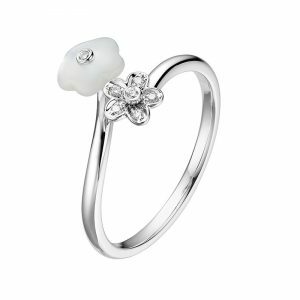 Alyssum open ring with flower shaped white mother of pearls and 0.035ct diamond-set flower. Set in 18ct white gold with a high polish. The graceful and feminine Snowdrop bangle with the leaf detail is the perfect contemporary jewel for the modern woman. Effortlessly wearable and refined, with the soft pearls and with or without the glistening 8 hearts and 8 arrows cubic zirconia, set in white rhodium plate or 18ct rose gold plate. Sleek and geometric lines are epitomised across the Nova Collection. 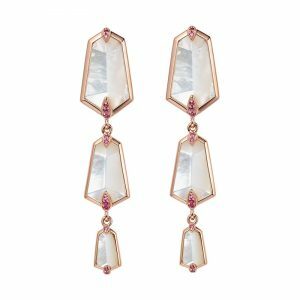 The beautiful asymmetry in these large 3 unit kite earrings are perfect for that contemporary look. Set with the iridescent mother of pearl and available in 18ct white with diamonds, or 18ct rose gold with pink sapphires.